Built entirely from timber and stone, the stone wall keep the villa cool in the summer and warm in the winter. Consquently there is no air-conditioning units in the villa but there is an underfloor cooling and heating system. The accomodation is all on the one floor and comprises of an open plan lounge / kitchen / dining area, one double bedroom with en-suite bathroom and Jacuzzi, and one double and one twin bedroom which share a bathroom. The pool terrace and garden are extensive and include lots of space for sunbathing, dining ,relaxing and enjoying the beautiful panoramic sunsets over Patara Beach. The large pool is 10 x 4 metres and has a depth of 1.55 metres. In addition to this there is a childrens pool with a hydro-massage jacuzzi system for everyone to enjoy. Adjacent to the chidrens pool there is a sand pit for children to play in plus several peices of play equipment. Due to its remote location this is an ideal choice for those guests desiring a high degree of privacy be it for religious or other reasons. This is an ideal location for families wishing to escape to a quiet peaceful spacious location. 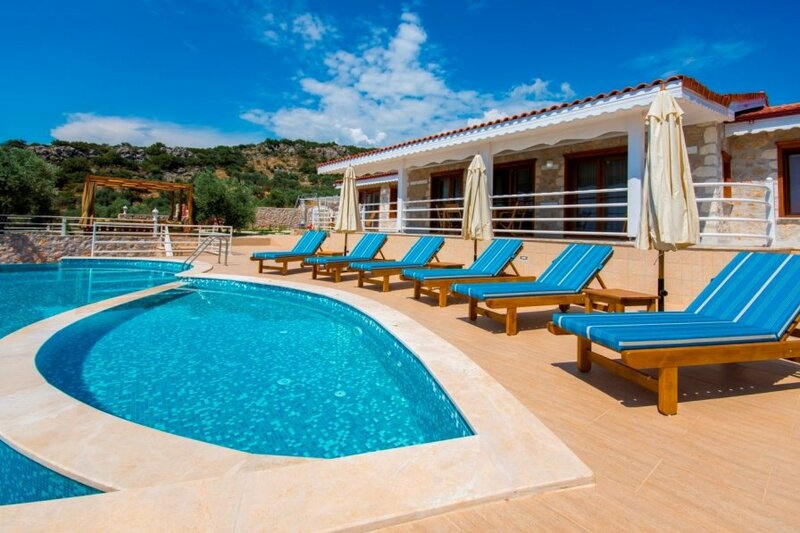 The villa is approximately 7 km from Kalkan, approximately 5-10 minutes drive away. The nearest grocers shop is 3 km away and the nearest restaurant 5.5 km. The villa has wi-fi internet.